The photo booths themselves range from former shopping centre machines, through to modern custom designs, are available commercially or home made and are even appearing in items such as vehicles. Neither do they have to be seated, many of the larger booths accommodate more guests based on them being in the standing position. Enclosed space offering more privacy for guests. Gives a traditional photo booth style experience. Usually instant print and fully automated. Guests have to pose themselves and often don’t look at the camera. Quality of result based on equipment. In contrast open style photo booths or portable studios tend to be areas set up within the event venue against which a photographer will pose your guests. He or she will then also operate the photographic equipment. In final result they tend to lean towards a single image as opposed to a compilation. Naturally the photographer will have greater experience in posing and ability to time the shot or take several to achieve the best result. Chances he or she will have greater control of the lighting and can offer more than a silly a snap. That’s not to say booths have bad lighting, it’s just they’re often limited on space for equipment. Not all photographers have the high speed digital printers used in photo booths, it maybe therefore that instant prints aren’t an option and photos have to be acquired afterwards via CD/DVD, email, websites or social media. More space for larger groups. Guests may have to purchase prints. What to consider in deciding which is best for you? 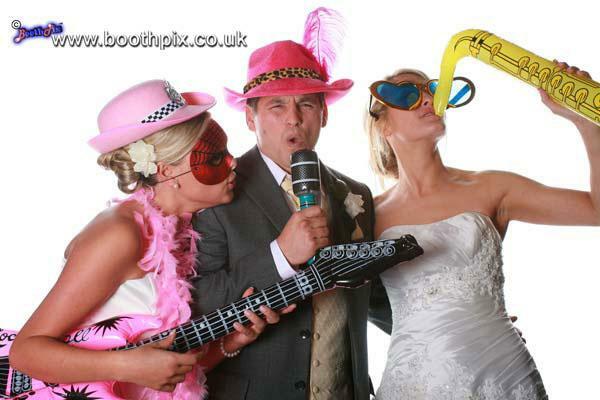 Photo booths tend to be all pre-hire; that is you hire them, usually for a fixed period of time (i.e. 3 hrs) during which guests have unlimited access. What you should look out for is that they use a modern digital printer capable of producing ‘dry’ prints in 10 –15 seconds. The technical term is ‘dye sub’. Photographers appear to offer a small or free attendance fee and charge the guests or a full pre-hire solution similar to photo booths for a period of time. You should check if they include onsite printing, particularly if you had this in mind as a memorable wedding favour. At the end of the day, it’s all about fun and memories and that little keepsake – the photo! So whichever solution you choose, your guests will love them.